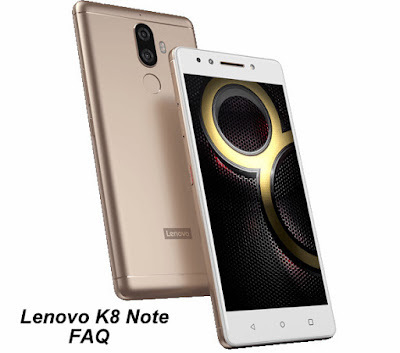 Lenovo has launched company's latest smartphone Lenovo K8 Note in India with Helio X23 Processor and Dual Rear Camera.Here are some of the Frequently asked questions about Lenovo K8 Note (FAQ). Q) What is the Display Size and resolution on the Lenovo K8 Note? Q)Does Lenovo K8 Note comes with Gorilla Glass Protection? Q)Does Lenovo K8 Note comes with Metal Body? Q) What is a Processor on Lenovo K8 Note? Q) GPU on Lenovo K8 Note? Q) How Much Free Space available out of 32GB.64GB? Q) Does Lenovo K8 Note has Dedicated MicroSD card slot? Q) Rear Camera on Lenovo K8 Note? Q) Lenovo K8 Note how much MP is the front camera? Q) Can Lenovo K8 Note Record 1080 Video? Q) Does Lenovo K8 Note come with 3.5mm audio Jack? Q)Does Lenovo K8 Note come with Touch capacitive buttons? Q) Lenovo K8 Note have NFC? Q) What are sensors on Lenovo K8 Note? Q) Does Lenovo K8 Note come with a fingerprint scanner? Q) Does Lenovo K8 Note has support for App Lock? Q) Which version of Android does Lenovo K8 Note run on? Q) Does Lenovo K8 Note support LTE and VoLTe? Will a Reliance Jio SIM work on the phone? Q) How much is Battery on Lenovo K8 Note? Q)Does Lenovo K8 Note comes with Quick Charge? Q) How much time it takes to charge 100% with Lenovo K8 Note? Q) Is Lenovo K8 Note waterproof? Q) Does Lenovo K8 Note Support FM Radio? Q) Connectivity options on Lenovo K8 Note? Q) Dimensions of Lenovo K8 Note? Q) Does Back cover removable? Q) Does Lenovo K8 Note comes with IR Blaster? A) Lenovo K8 Note comes with a dedicated music key that can be reassigned to perform a number of functions like Open Camera, WhatsApp, Take Screenshot, Use Flashlight. Q) Weight of Lenovo K8 Note? Q) In which color Lenovo K8 Note will be available? Q) From when Lenovo K8 Note will go on sale and Price? A) Priced Rs. 12,999 for the 3GB RAM with 32GB storage version and Rs. 13,999 for the 4GB RAM with 64GB storage will be available exclusively on Amazon.in starting August 18th 12 noon.